Sophie Lefevre is a rather headstrong woman dealing with a difficult situation in 1916 France. She has returned to her hometown while her artist husband fights against the Germans. Her husband felt she would be better served in a rural location rather than staying Paris. Unfortunately her town and her family's inn are soon under the control of the Germans. Sophie watches her sister, niece, nephew and young brother slowly starve as food becomes scarce. When she is offered the opportunity to feed them as a direct result of cooking for the Germans she hesitates but realizes she has little choice in the matter. What follows is a game of cat-and-mouse as she tries to avoid the attention of the local Kommandant. When she finds out that her husband has been captured and there's a possibility she may be able to see him one more time she's willing to do almost anything for that chance, even giving up her most prized possessions -- a painting and her virtue. Fast forward ninety-six years to England and Liv Halston is a young widow still mourning the death of her husband. Three years after his death, she lives in the house he built and works for a foundation developed to instill a love of architecture in at-risk youth. Liv barely makes a living as a copywriter, but isn't willing to consider giving up her home or the painting her husband had purchased for her during their honeymoon. Things get very bleak when she receives notification from an art recovery service that her prized painting was stolen during World War I. In Liv's quest to keep her painting she is willing to give up almost everything but at what cost? The lives of Sophie and Liv are mirrored by the risks they are both willing to take to protect a painting. For both Sophie and Liv the painting represents life with their beloved husbands. Ms. Moyes deftly weaves a story that spans nearly a decade in the telling. As Liv fights to retain what she sees as rightfully hers, she also fights to uncover Sophie's story and the story of the painting. The Girl You Left Behind provides background on the tragedies that occurred in France during World War I as part of Sophie's story. It also provides insight into the steps families can take, even a century later, to reclaim their possessions. This story includes the tragedy of war and the effect on those left behind, as well as the despair and grief of those mourning their loved ones. I read The Girl You Left Behind in one sitting as the story grabbed my attention and I couldn't put it down. If you enjoy contemporary novels that incorporate a blend of the historical with elements of intrigue, tragedy and romance, then you'll definitely want to read this one. This was actually the first novel I've read by Ms. Moyes and I can't wait to read more. 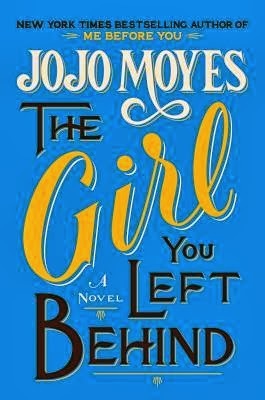 Learn more about author Jojo Moyes and her books by clicking here or visit the author's website: http://www.jojomoyes.com/. Disclaimer: I received a digital copy of this book free for review purposes from the publisher via NetGalley and SheReads.org. I was not paid, required or otherwise obligated to write a positive review. The opinions I have expressed are my own. I am disclosing this in accordance with the Federal Trade Commission's 16 CFR, Part 255: "Guides Concerning the Use of Endorsements and Testimonials in Advertising."